Robin Chait is a Senior School Choice Policy Associate with WestEd’s Learning Innovations program. Chait supports the expansion of a portfolio of work that makes significant contributions to improve the equitable distribution of high-quality school choice options and charters for students. Her expertise includes charter schools, school choice, and policies and programs that improve teacher and principal effectiveness. 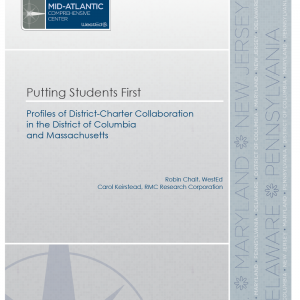 Prior to joining WestEd, Chait led policy, communications, and fundraising for Center City Public Charter Schools, a network of pre-K through 8th grade schools in Washington, DC. She also served as Director of Teaching and Learning at the Office of the State Superintendent of Education, where she supported both charter and traditional public schools in implementing the Race to the Top grant; as Associate Director for Teacher Quality at the Center for American Progress, conducting research, writing policy briefs, and developing state and federal policy recommendations; and as a third grade teacher through the DC Teaching Fellows Program. Chait began her education career in the U.S. Department of Education, where she worked on evaluations of federal education programs. She holds a master’s degree from Georgetown University’s McCourt School of Public Policy and a Master of Arts in Teaching from American University. Webinar: School improvement in the Charter School Setting, Tuesday, May 6, 11am. Register Today.